A print-centric view of engagement and interaction? 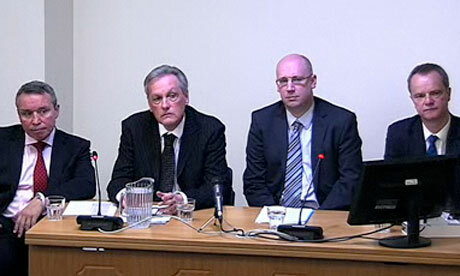 I spent most of today with the Leveson inquiry livestream playing in one of my tabs, listening if not watching, as the regional editors gave evidence. These were the ones I was really interested in hearing from – the Dacres and Hardings may make better copy but regional media is where I play and I wanted to know what these editors (two of whom I’ve worked for and admire) had to say. The first thing that struck me was the way eight senior editors, heard from in two groups, were forced to scrunch themselves around a small table as though they were playing musical chairs – poor John McLellan obviously lost that particular round. The other aspect that became apparent as the day went on just what different beasts the regionals are from the nationals; so much so that it seemed, at times, as though interlocutors were a little lost as to where to take their questioning next. The witness statements from today are all here and make lengthy but worthwhile reading (although everyone was terribly eager to please and there is an excruciating bit of joyless banter involving Yorkshire/Lancashire rivalry). But – and I don’t get to follow Leveson much due to the fact that there are websites and papers to edit and meetings (so many meetings) to attend so if I’m wrong please tell me – what I mostly took away from today’s immersion in the hearing was that it seems very print-centric. Reader letters/emails are obviously one way to gauge reaction, and editors active in their communities will get some face-to-face feedback. But I was surprised that the discussions about interaction and perception failed to touch on the online engagements and interactions each paper experiences, no doubt almost constantly, throughout the day; the comments posted under stories, replies to tweets, postings on Facebook walls, shared/recommended metrics and more. When Wales on Sunday publishes I obsessively actively check Facebook and especially Twitter throughout the day (for both its @WalesonSunday mentions and for a Wales on Sunday saved search) to see what people are saying. Sometimes it’s good, sometimes less so – but 99% of the time the chatter around the paper that I see focuses on different positives and negatives than the ones I have, or would expect to people to pick up on. That’s probably because I have ingrained perceptions from being imeshed in producing a paper. Newsrooms now have constant, rolling feedback from former audiences who are now able to insert themselves into the narrative. Reporters, digital teams, newsdesks, know faster (and sometimes more viscerally) how their work has been received than ever; the mood around the tone of a story can be assessed within a few interactions – or could actually be influenced in advance of publication with a few judicious inquiries using social networks. Leveson was asking editors if they were listening to their audiences; they answered that they were – but the reality is that they probably don’t realise just how closely their newsrooms really are listening, reacting and adapting; that was, for me, the big question the inquiry missed asking or learning about today.